You can use the Universal Depth Rod not only when you are determining the direction to a treasure or a mineral deposit but also when determining depth. When you are ready to determine the direction to your treasure, load the sample compartment in the base of the instrument with the appropriate sample and hold the instrument as shown in the photo labeled "Finding the Direction." The high tensile spring rod allows easy observance of the slightest dowsing response. You either follow the direction of the swing or use the method of triangulation. When you think you are over the top of your target, hold the instrument straight down as in "Finding The Direction" and watch to see if the end of the instrument operates in a circular pattern. To estimate the depth of your treasure, hold the depth rod horizontally as in the bottom most photo. First try it directly over the spot and observe to see if it bobs straight up and down. Then move out to the side from that spot, and keep taking readings until you see the tip of the instrument bobbing at an angle of 45 degrees, as shown in the drawing. You can estimate the depth of your treasure to be equal to the distance from the center point to the place where the tip bobbed at a 45 degree angle, less about 3.5 feet. The Universal Depth Road can be used to search for gold, silver, mercury, lead, copper, diamonds, paper money, oil, water, or any other substance. You need only to insert a small sample of whatever kind of material you are looking for into the sample compartment. 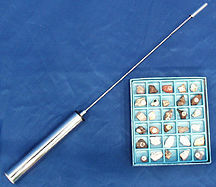 The price of this instrument is $695 complete with samples to use when searching for gold and silver, a mineral sample set containing 30 other samples of valuable metal and mineral ores, including ores of copper, lead, zine, uranium, nickel, iron and opals and comprehensive operating instructions. 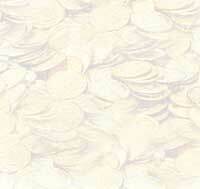 You may send cash, check, money order or charge it to your credit card. This instrument is unconditionally guaranteed for 10 years. If any service or repair is required during this period, it will be performed free of any charge. The Universal Depth Rod is sold on a 30-day trial money-back guarantee. If it does not perform exactly as advertised, return it in good condition and your money will be immediately refunded.